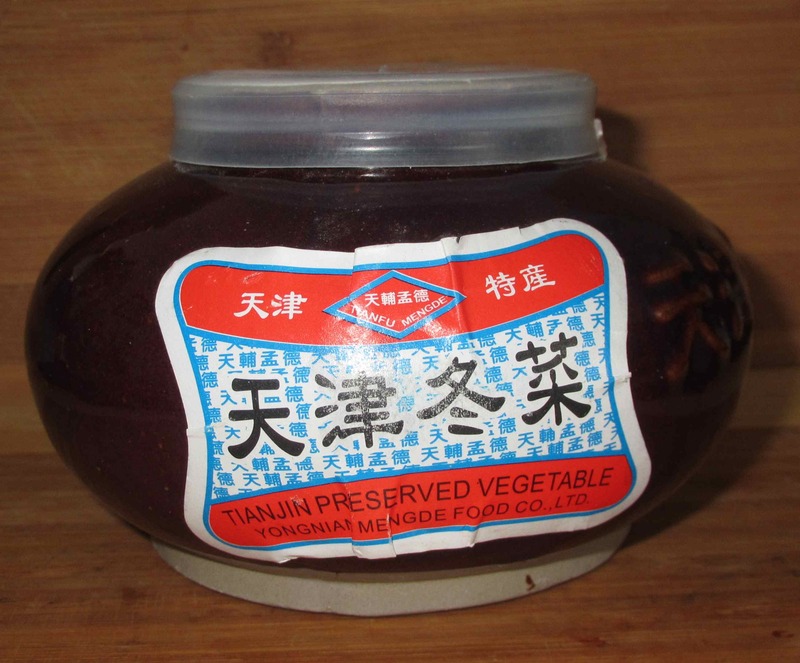 These give the common Chinese name of the pickle and mean ‘Tienjin Winter Vegetable’. 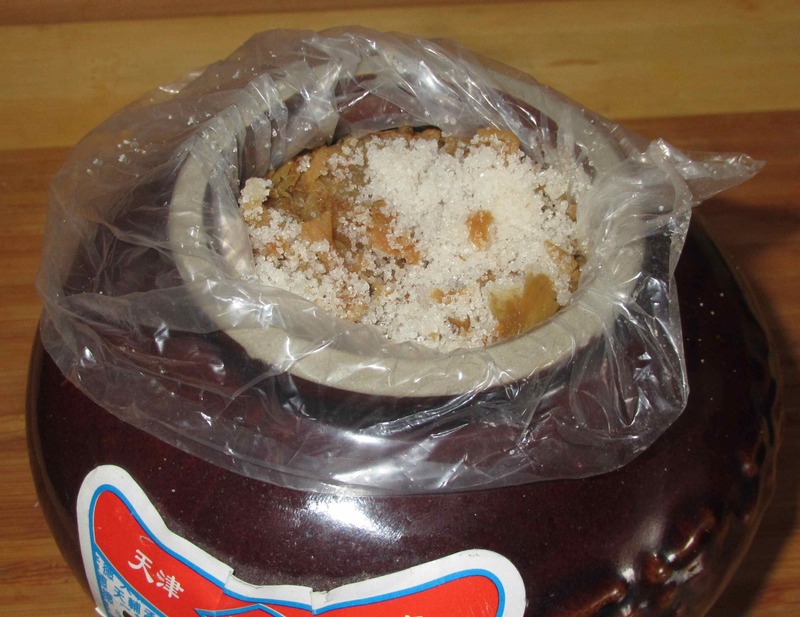 Basically, the pickle is made by drying cabbage in the sun and then fermenting it indoors, usually with garlic or a type of red-skinned leek native to the are around Tienjin. This particular product lists just cabbage, garlic and salt as the primary ingredients, but it does advise (warn?) that it may contain sulphite. 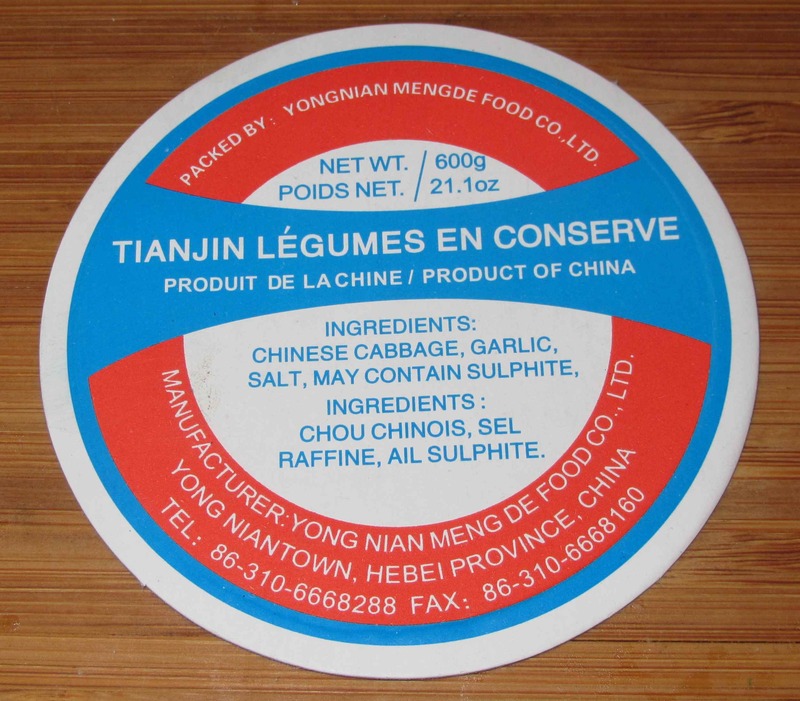 There are several sulphite compounds that are used, both in Asia and the west, as anti-bacterials and preservatives and it seems odd, then, that if one or other were intentionally added as a preservative, the manufacturer would be unclear as to whether the product contained it or not. In this case, though, the French translation may be of some assistance as it specifies ‘garlic sulphite’ and, indeed, garlic, along with several other plant products, does contain naturally occurring sulphite compounds. In any event, some people do have a sensitivity to these chemicals but, given the amount of Tienjin pickle that anyone is likely to consume at any given time, I can’t see it as being much of an issue. As you can see, the pickle itself is also protected within an inner plastic bag and is covered by a pretty substantial layer of salt crystals. Traditionally, Tienjin winter vegetable is cured with pure sea salt but the French ingredient list specifies ‘refined salt’, so who knows what exactly is used here. 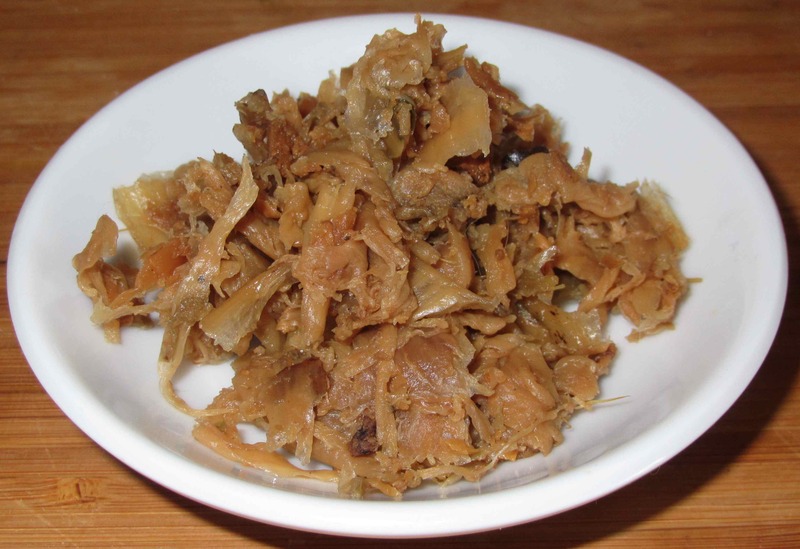 The cabbage once preserved takes on a rather uniform brownish color and, in this particular product at least, it is not possible to discern any garlic or leek in amongst the homogenous leafy mix. The aroma is really quite strong but has none of the sharp tang, or sulfurous qualities of sauerkraut (or even garlic for that matter). It is quite sweet, actually, and although there is a bare hint of fresh cabbage or turnip somewhere in the background, the dominant quality is more reminiscent of a rich, aromatic tobacco, with a faint note of Demerara sugar. The pickle is indeed very salty and this is the first taste component one notices on sampling it straight from the jar. Very quickly, though, this gives way to a rich, very umami quality that only hints of cabbage and has none of the sharply sour notes one typically finds in pickled greens. There is a slight tang, but it is mostly sweetish in the same, somewhat aromatic, way you find in cured products like fine ham or dried oyster. The salt, as I say, is very apparent but, when used in small amounts, this can simply be adjusted for when adding other seasonings to dishes. Otherwise, a simple rinse with fresh water should suffice to tone this down a bit. By the way… on the subject of rinsing, this may be advisable in some cases anyway as the pickle can occasionally be a bit sandy. This particular crock, did have a bit of grittiness in a couple of pieces I tried but this is actually the first time I recall encountering this so, depending on the brand, or batch, you purchase, this may, or may not be an issue. 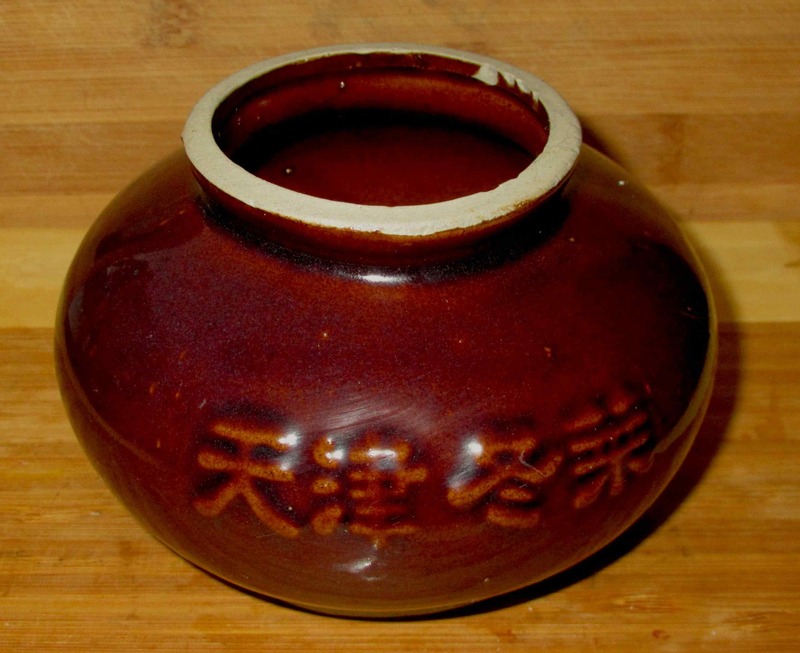 As to the use of the pickle, it is commonly added, in small amounts, as a flavoring to soups, stews and congee. It can also be added to stir-fried dishes, or, and this is my favorite use, as an additional flavor for dumpling fillings. Finally, one of the nice things about buying the pickle this way is the lovely container, which you can see pictured here with the labels removed. It is very pretty and, aside from being a useful container for various foodstuffs (homemade pickles or condiments, for instance), it could easily be adapted for use as a planter. I spent only $6 or so for this purchase, and since the pickle is used very sparingly and keeps just about forever in the fridge, the crock is very much a free bonus. I have tried to make my own pickles and such as sulfites always give me a migraine headache. However they are tasty in many dishes. This brand seemed to be really low in garlic… mostly cabbage as far as I could tell. Thank you… the pickle really is worth trying if you get a chance. Don’t know about the contents, but I do like that cute container! I do quite like this precisely in soups, stews, and congee. I didn’t as a child, but have come to really appreciate it as an adult. Hi, I like the little pot more than the preserved vegetables, but thanks for sharing your recipe. i just came back from a short trip to Yunnan, china. Not too much good food to share!